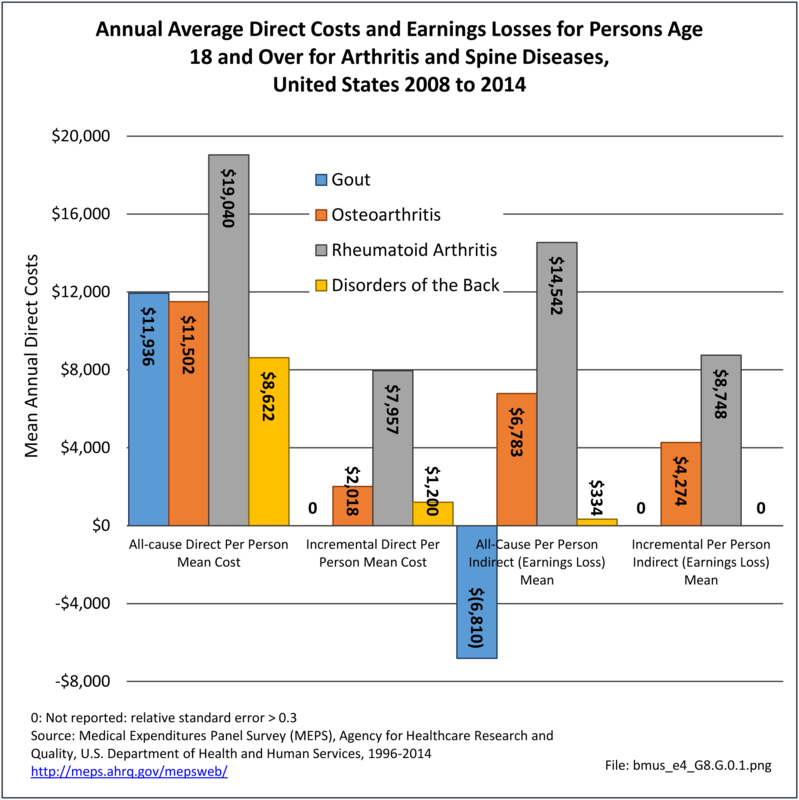 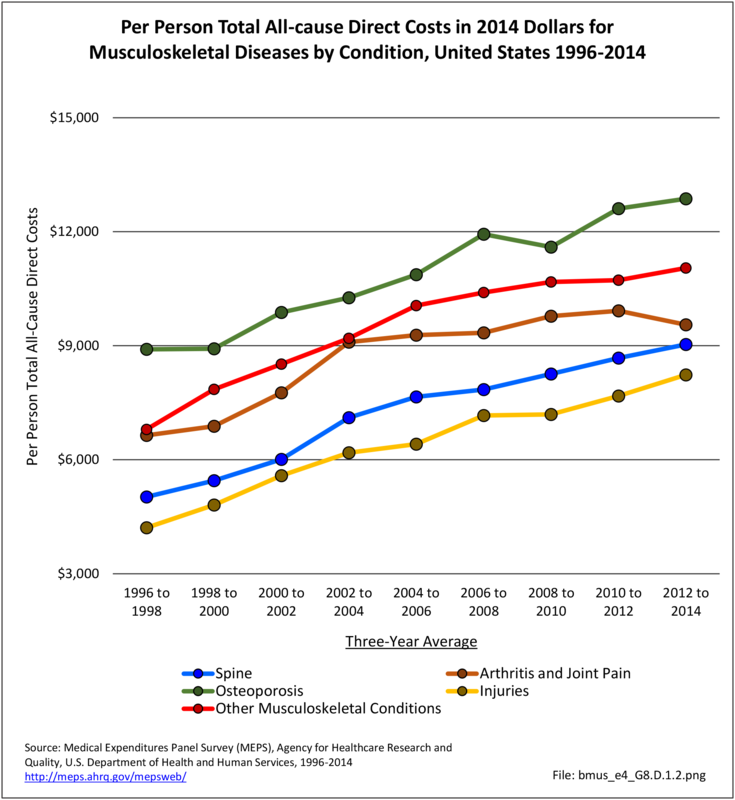 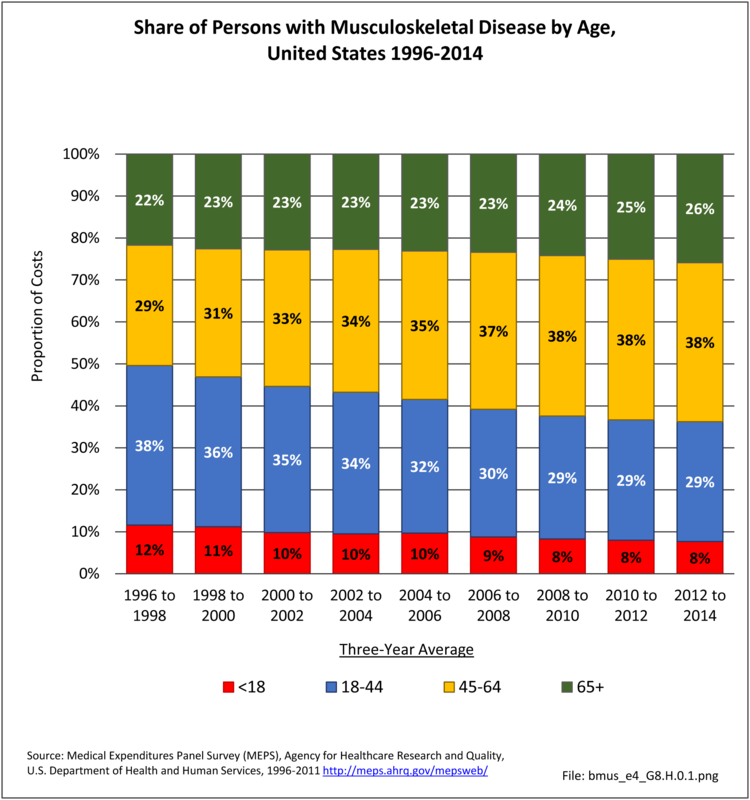 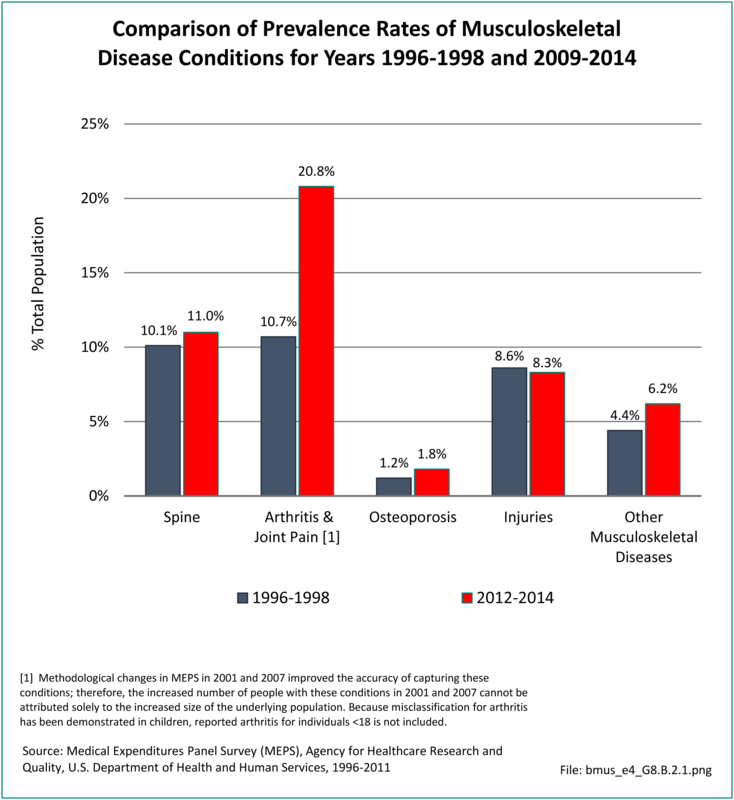 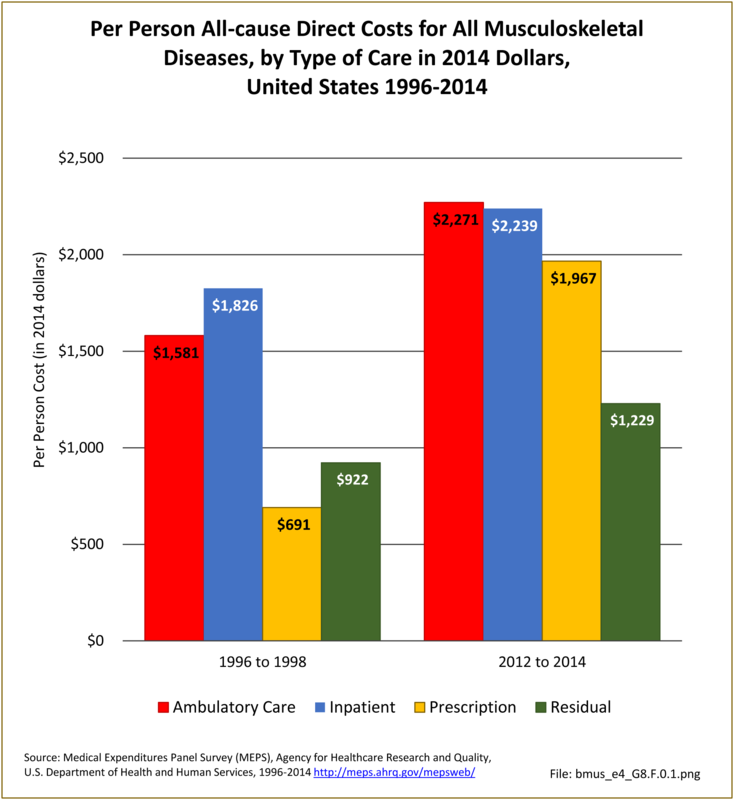 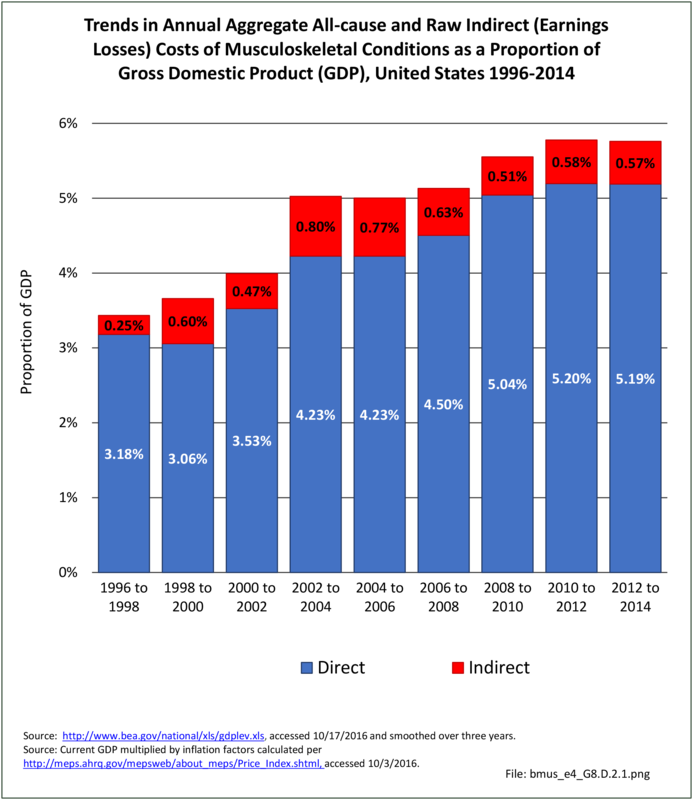 Because of the higher prevalence and relatively high level of expenditures per person, aggregate all-cause expenditures have consistently been greatest for arthritis and joint pain, accounting for $626.8 billion in healthcare costs in 2012-2014. 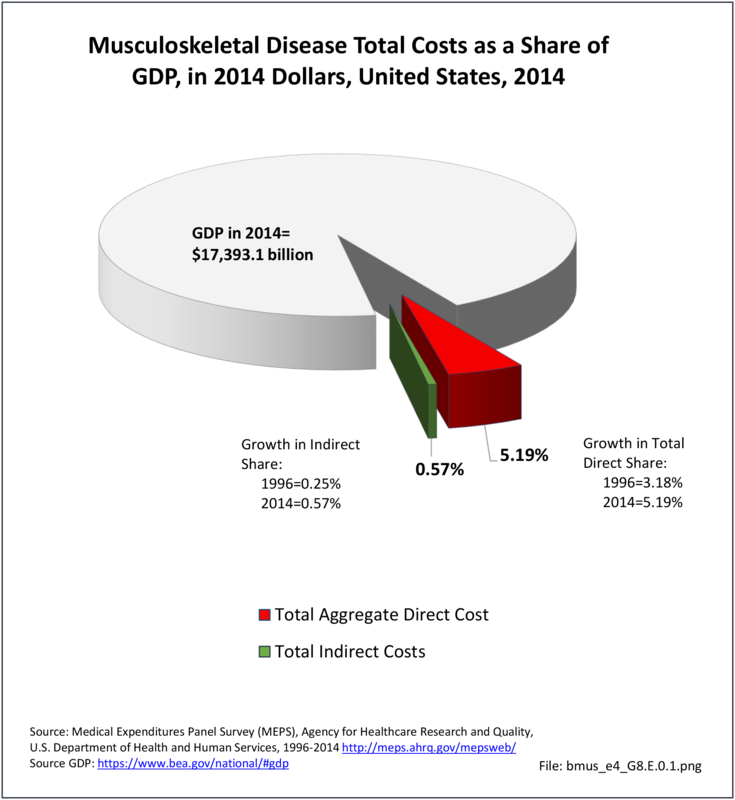 Spine conditions, with an estimated $315.4 billion aggregate cost in 2012-2014, are the second most expensive musculoskeletal healthcare condition. 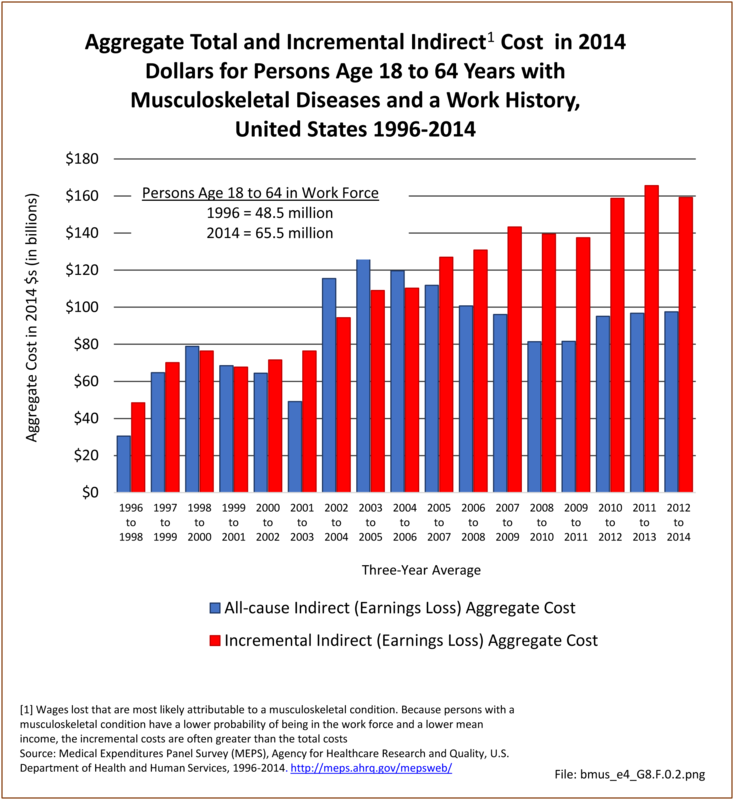 Aggregate costs for injuries and other musculoskeletal conditions were $213.7 and $214.8 billion, respectively, in 2012-2014. 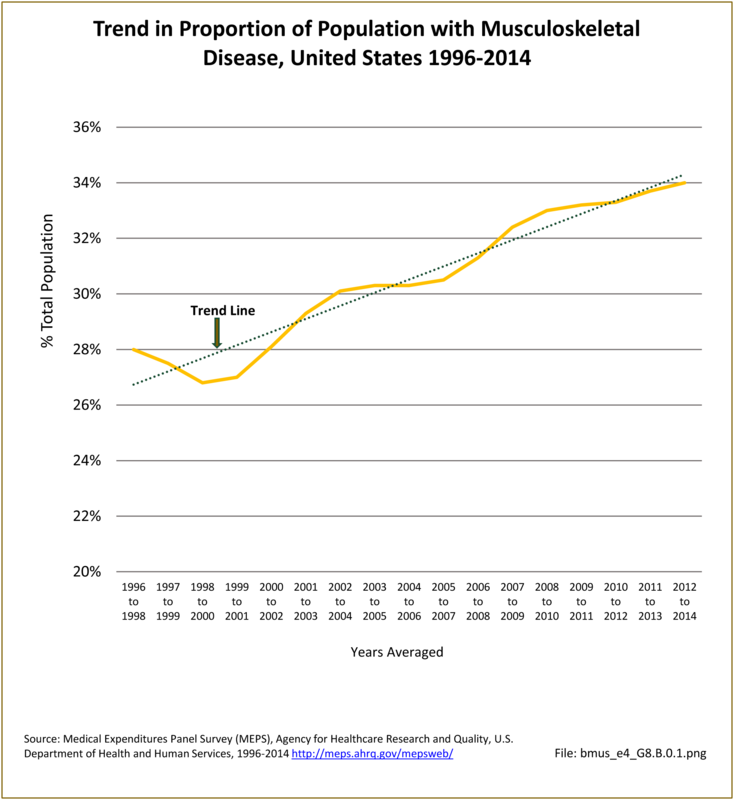 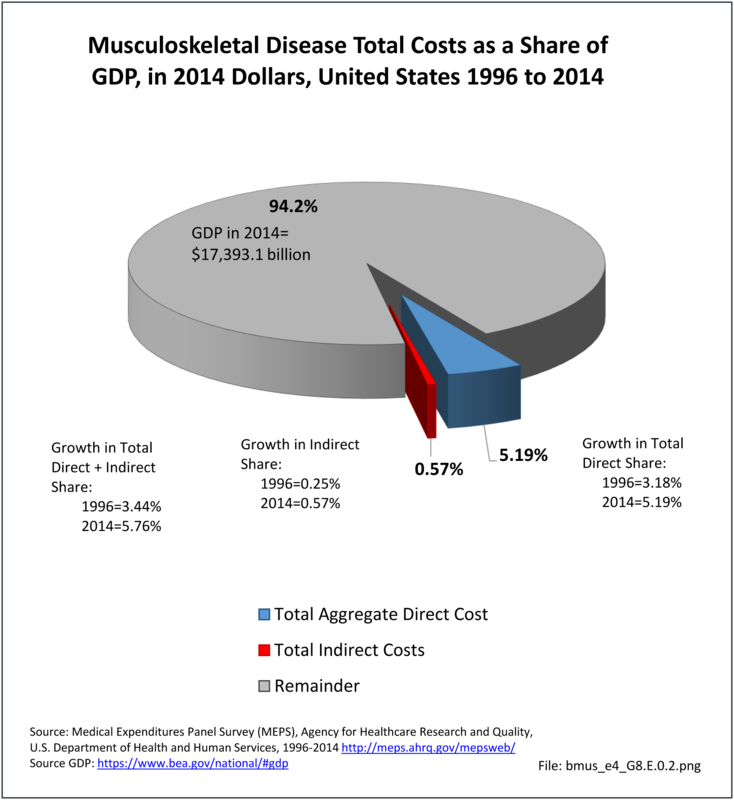 Osteoporosis, with $73.6 billion, accounted for the lowest aggregate of all costs. 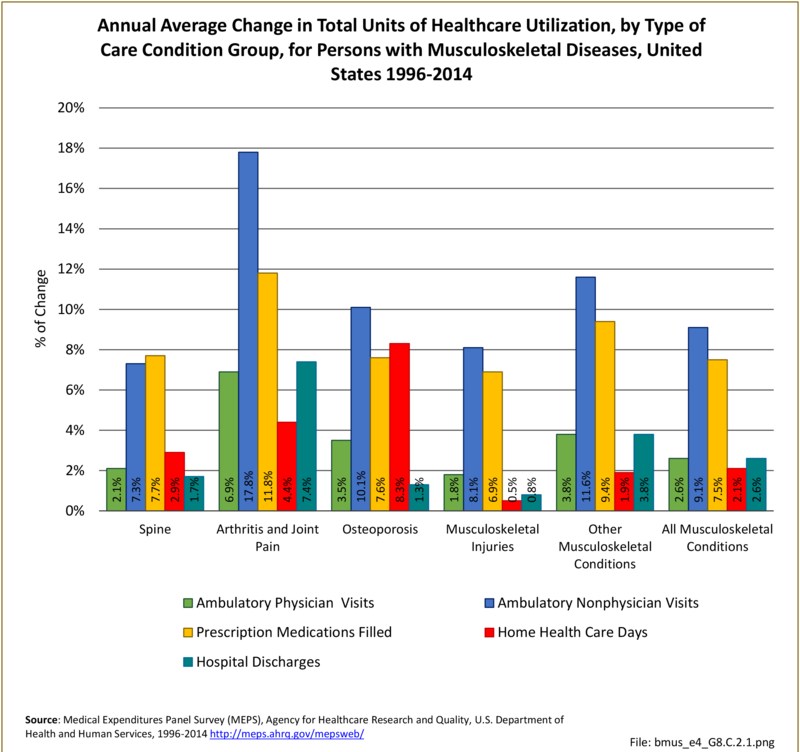 Totals for subconditions, when summed, exceed the overall total due to the potential for persons to be included in more than one condition group. 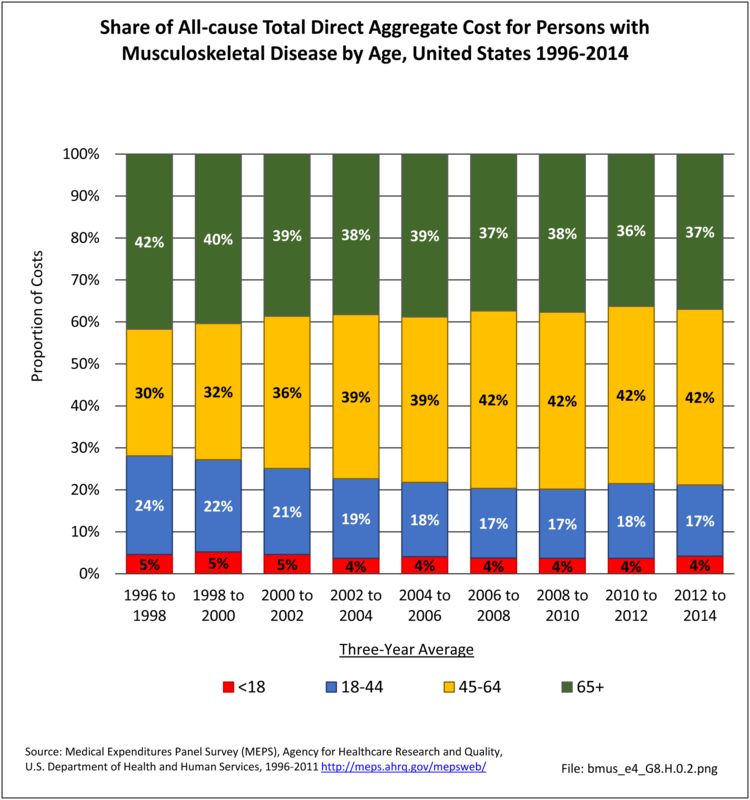 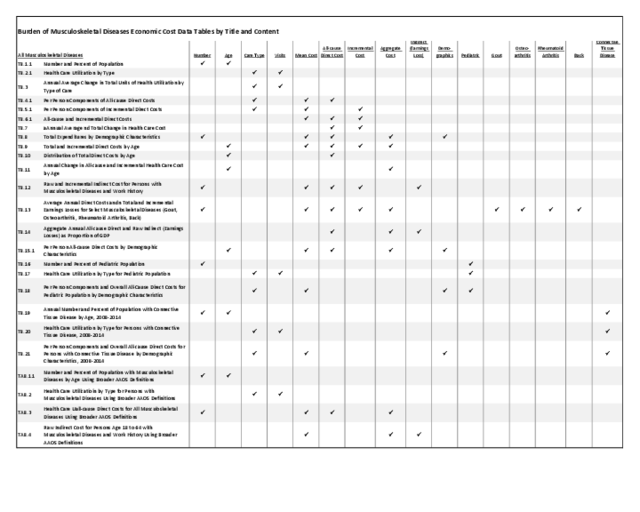 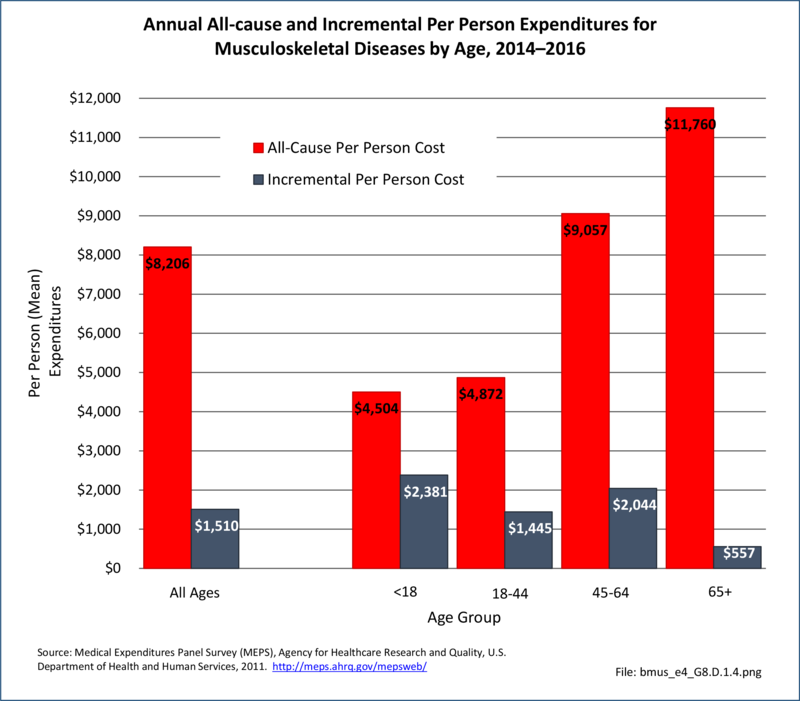 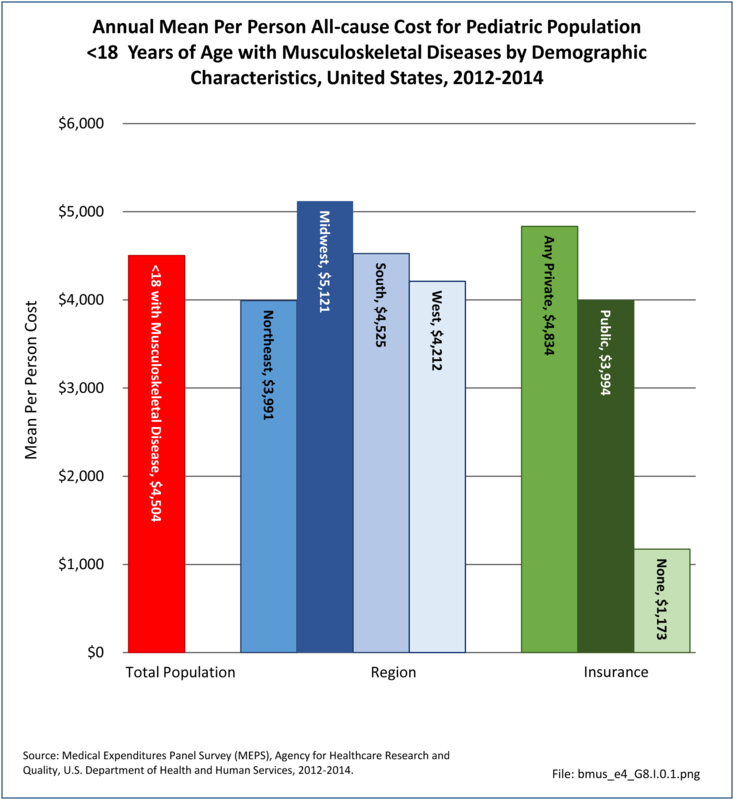 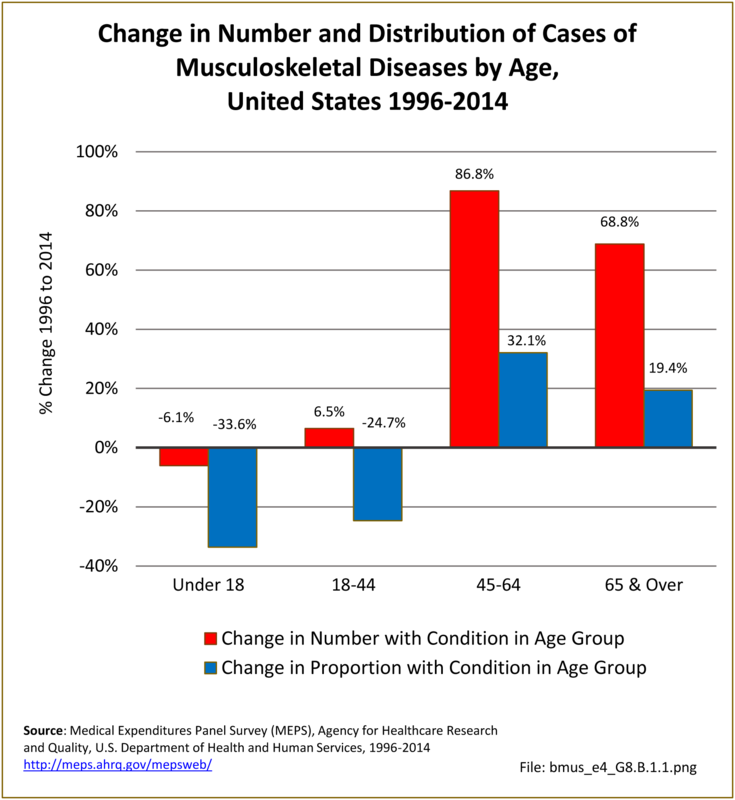 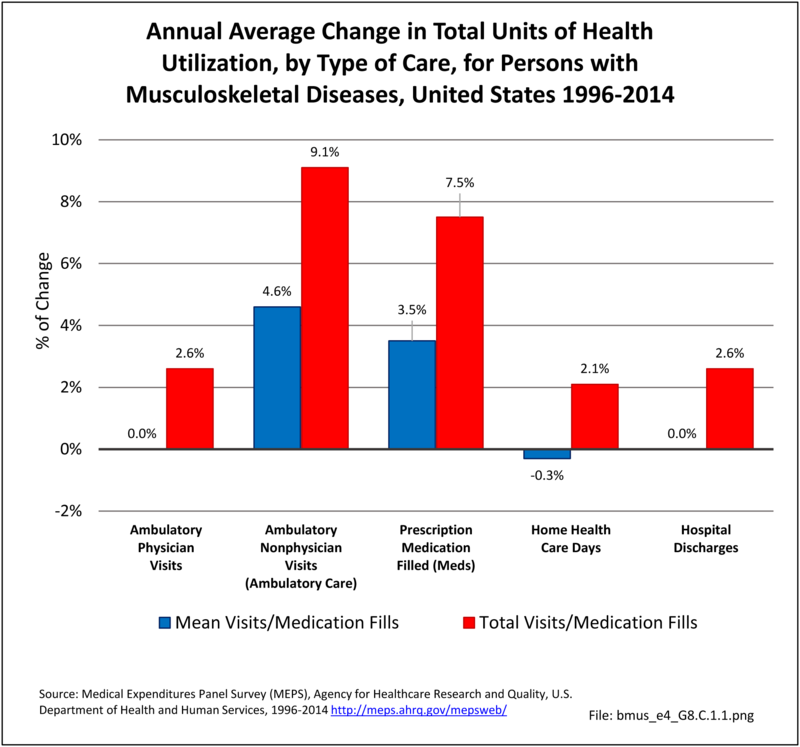 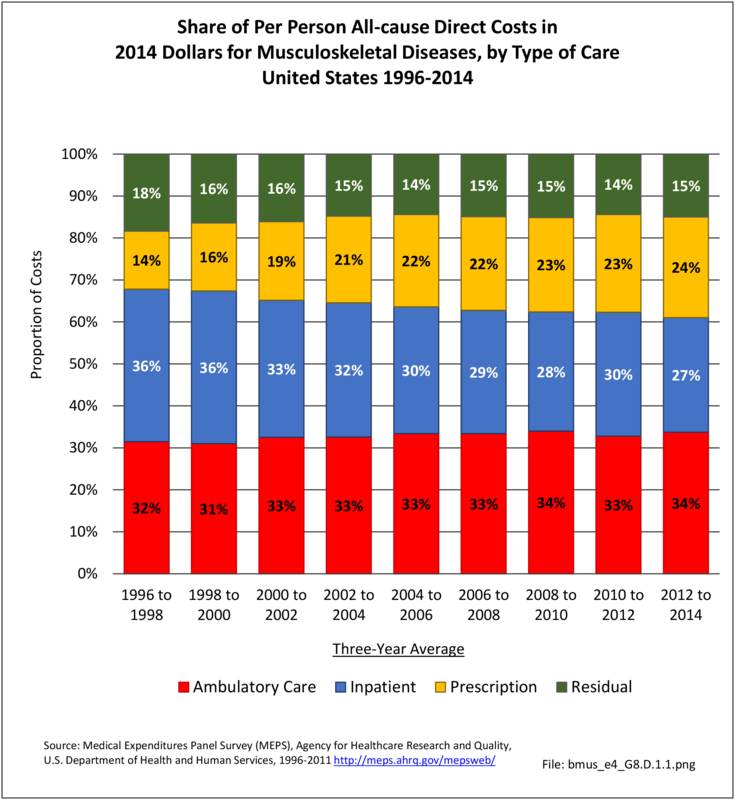 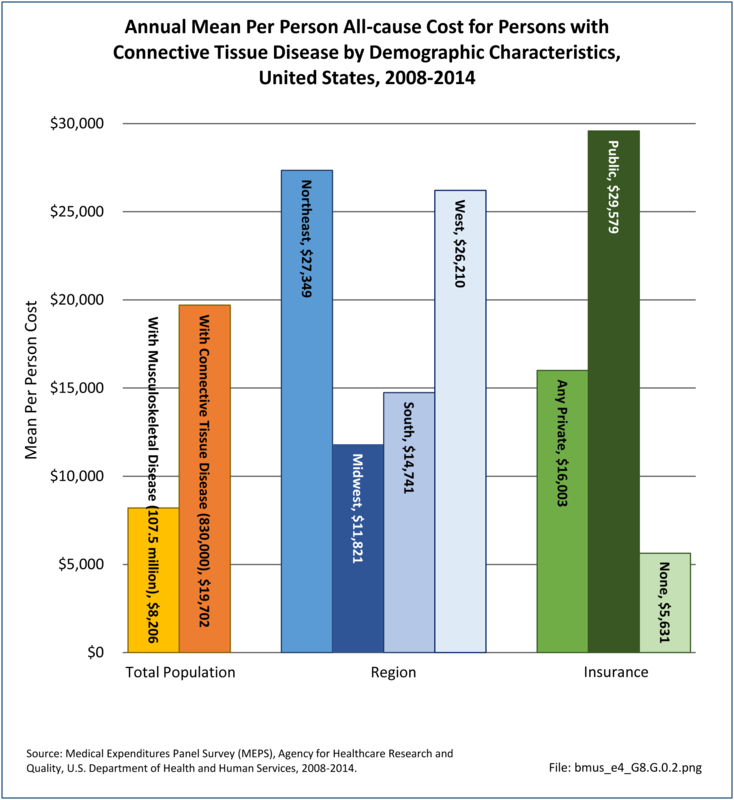 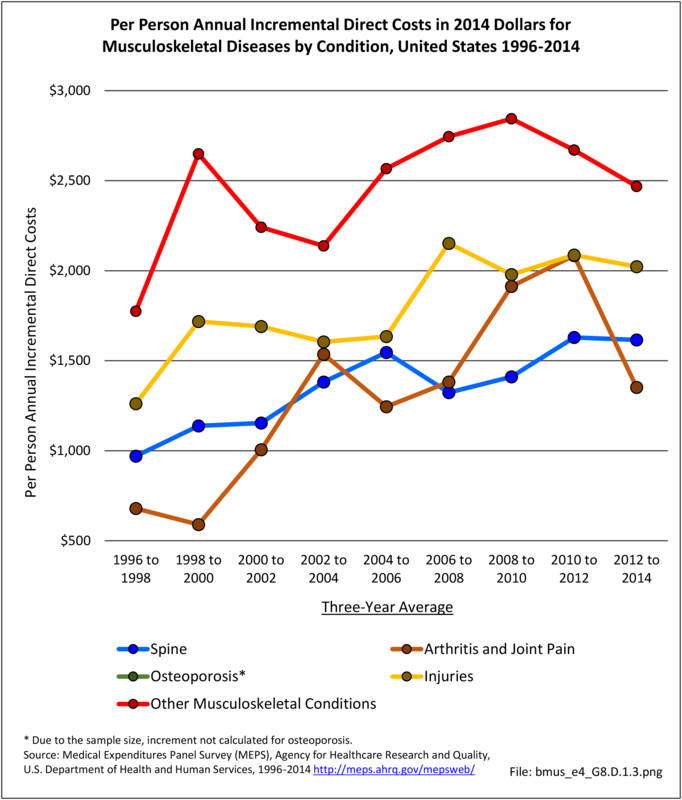 Unlike other tables on economic costs of musculoskeletal conditions that use an average of three years of data for sequential years, analysis based on demographic characteristics uses a single year, resulting in 2014 costs that are somewhat different than those for 2012-2014. 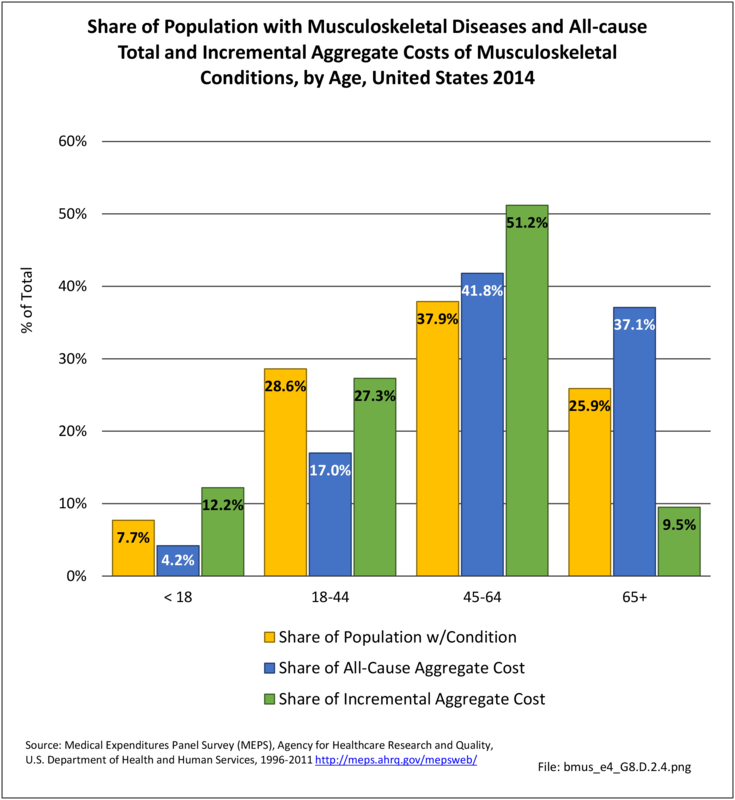 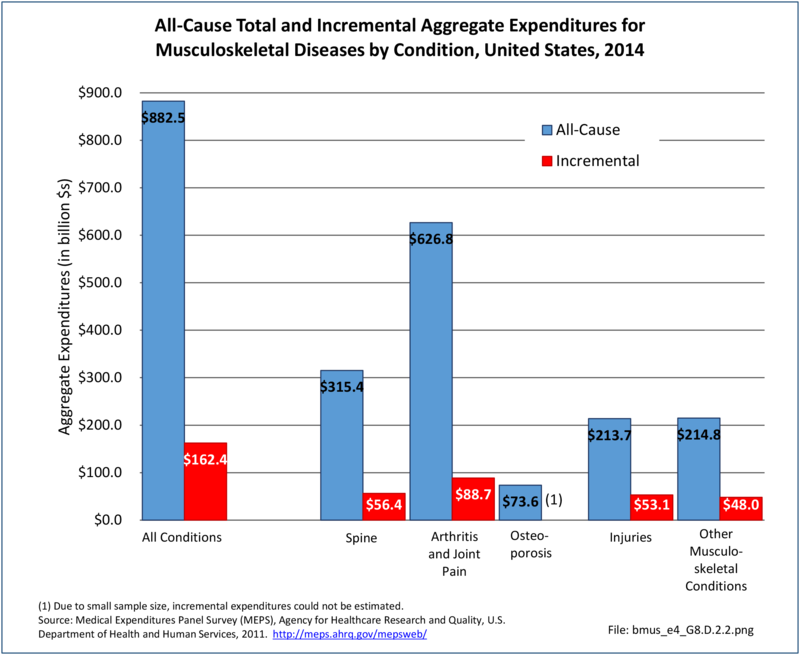 In 2014, aggregate all-cause expenditures for musculoskeletal conditions totaled $919.4 billion, slightly higher than the 2012-2014 total. 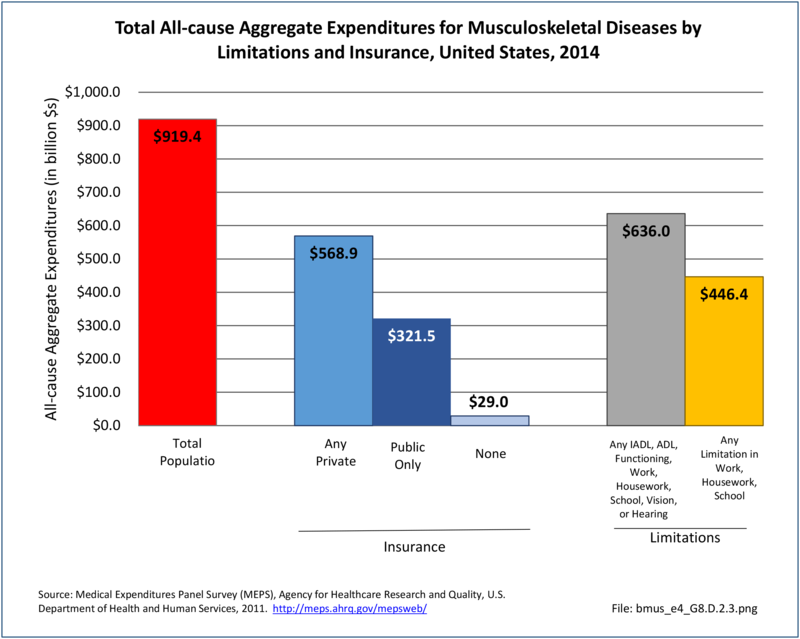 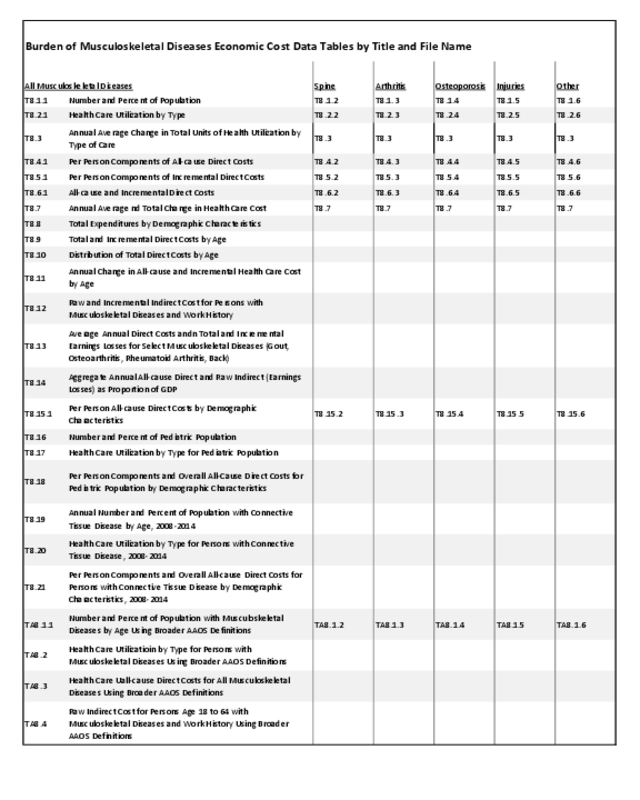 Because per person all-cause expenditures were lower among those without insurance ($4,065), aggregate expenditures on behalf of the approximately 7.1 million without insurance were only $29.0 billion; the bulk of the aggregate expenditures occurred among the 71.4 million with private insurance ($568.9 billion) or the 30.4 million with public insurance ($321.5 billion).